I’m trying to write my initial Final Fantasy XIV: Heavensward expansion MMO log in such a way as to minimize my time away from Final Fantasy XIV: Heavensward. This is a good sign. 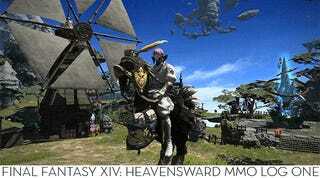 Early access for the first major expansion pack to Final Fantasy XIV: A Realm Reborn launched on Friday, June 19. I finally began accessing the expansion pack content on the afternoon of June 24, one day after official launch. Yes, I spent nearly six straight days working through my backlog of Final Fantasy XIV story content, the completion of which is a requirement to access the new lands and jobs of Heavensward. That arduous trek through upwards of 100 quests merely served to bolster my opinion that no other MMORPG does story like Final Fantasy XIV. I’d only finished the story from the original release of the game. The tale that unfolds through the post-launch, pre-Heavensward content is as intricate and layered as that of any major numbered Final Fantasy release. I’d only wish I’d completed it sooner, so the spectacular finale would have had more time to sink in. My advice for those looking to return to the game now that the expansion pack is out, my advice would be to take your time. There’s no rush to hop into the expansion if you’ve not finished the story—outside of the new race introduced there’s really no reason to. Savor those moments. My “Finally made it!” tweet received a response that sums up the early moments of Heavensward quite succinctly—”prepare for the fetch quests.” My first steps into the Holy See of Ishgard, a frozen, intrigue-filled city on the brink of both civil and draconic disaster, we’re a bit of a slog. Go here, meet this guy, bring this thing to that person. For someone who’d been immersed in mostly meaningful story quests for the past week, the sudden return of “kill three bird creatures” tasks is jarring and tedious. Another snow-filled land, much like the one we’d just left at the beginning of our Heavensward journey. North is cold. Well, at least North is cold on the ground. This land of the ice and snow is but one option. The other is a completely different sort of ‘70s rock reference. What’s that, Heavensward? You want me to adventure on the back of a magical chicken through a series of Roger Dean’s Yes album covers? This is something I will gladly do. Sprawling, towering, hanging spires in the sky—this is pretty much everything I dreamed of as a young lad listening to my brother’s progressive rock collection in my grandmother’s musty attic. If I’m going to have to collect the wings off of flying cats or investigate that massive flying whale seen in all of the expansion pack trailers (you can call him Biz), then this is the proper place to do it. The tedium is light, assuaged by the new sights and gorgeous new music, and as soon as the story kicks back into high gear the standard quests are once more a lovely bit of respite from the massive set pieces and powerful drama. For example, two of the three new adventuring jobs—Machinist and Astrologian—get their start via entertaining quests in older zones—handy considering each new job begins at level 30. I’ll have more on those two and the new Dark Knight class in a later log. Let’s just say I’ve already picked a favorite. Beyond that, there’s plenty of unfinished business to attend to back in Ul’dah, Limsa Lominsa and Gridania. One particularly clever bit of story took place in the dungeon of Hatalati, an instanced dungeon normally meant for a group of players, re-built into the setting of an extended solo story quest. What a brilliant way to re-use existing assets. Obviously I’m early in here, having only seen one massive city and portions of two massive new zones. I’ve only just gotten my Black Chocobo and set about performing the quests and collecting the items required to grant him flight. I’ve reached level 53—I hit 51 while playing catch-up—and outfitted myself in easy to acquire gear better than anything I’d had previously. I’ve barely scratched the surface of the new jobs. That said, I’ve already encountered story hooks and new characters I know will keep my playing until the very end. The new lands compel me to explore every inch by land and—eventually—by air. I unlocked my first new dungeon about two hours before writing this log, and I cannot wait to see what lurks inside. In fact I think I’ll hop into a queue now. We’ll talk next week.